This free app has been developed by Newcastle University in partnership with Bloodaxe Books to allow readers to read, watch, listen to, and share poetry on their mobile devices. 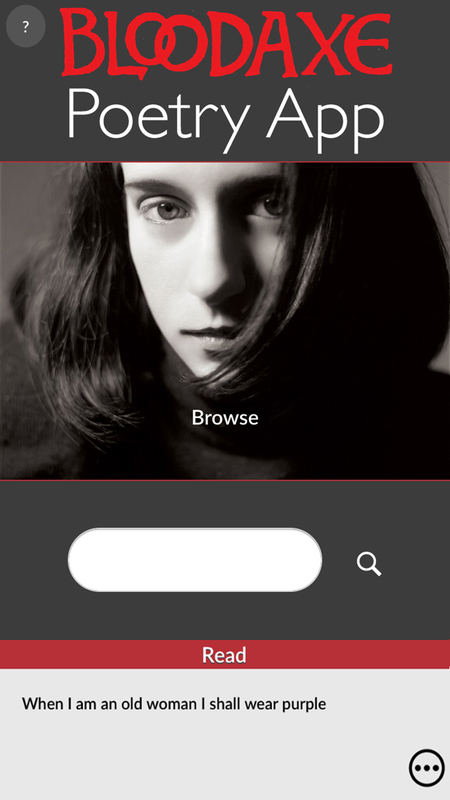 From the Home screen, you can Search the app for a particular poem or poet, or the allow yourself to be guided by the random opening lines appearing at the screen. Content can be browsed by name of Poet and by title of Poem, or by poems featuring Audio or Video recordings. Poets are also sorted in Categories and poems featured in the app have been tagged with Themes to allow you to browse related content. Once you have added some poems to your Favourites list, you can use this option to navigate to them quickly. After reading, listening to, or watching a poem, the app currently allows you to share poems and recommendations via social media and email, add the poet to your Favourites list, or tag the poem with themes. You can also change how the poem appears on the screen using the Display option.